19 Point Pennzoil Oil Change & Service Completed in 10 Minutes! With coupon only. Most cars $1.00 environmental fee. Not valid with other offers. Grant’s Lightning Service is the trusted and quality auto repair shop in Parma Heights, OH, that you’ve been looking for. 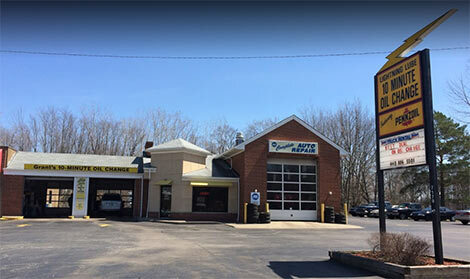 For more than two decades, Lightning Service has been providing experienced, professional auto service at our family owned and operated auto repair shop in Parma Heights, OH. We offer dedication and commitment to every job we do, whether our highly trained mechanic is working on a quick oil change or more extensive muffler repair and transmission service. Our full service auto shop can perform the car maintenance you need with the knowledge and ability to get you back on the road quickly. While we specialize in brake repair, we also offer an array of other services when it comes to auto repair. From timing belt replacement to tire rotation, an oil change, failed e-check and other various vehicle diagnostics, or car air conditioning repair, we do it all! If your check engine light is on or you need new tires or batteries, a 10 minute oil change and quick lube, a new exhaust system, or a general tune up, let us show you what makes us the best. Our ultimate goal is your satisfaction and long term business. We take all the steps necessary to make you feel comfortable as one of our greatest assets and family members.